Heeft u een vraag voor Starria Hostel? Gesitueerd in het gezellige Myeong-dong, geniet het Starria Hostel in Seoel een goede reputatie onder reizigers met een interesse in winkelen, bezichtiging van bezienswaardigheden, restaurants. Het stadscentrum is slechts 0.00km verwijderd en het vliegveld kan worden bereikt binnen 70 minuten. Voor 'sightseeing' en lokale attracties kan men terecht in de buurt van het hotel, dat nabij Seoul Animation Center, Honorair Consulaat Generaal van de Republiek van Gambia, Beautiplex (Myeongdong) ligt. Profiteer van de ongeëvenaarde dienstverlening en voorzieningen in dit hotel in Seoel. Voor het comfort en gemak van de gasten biedt het hotel gratis wi-fi in alle kamers, wi-fi in openbare ruimtes, familiekamer, tours, wasserij. Ervaar kamerfaciliteiten van hoge kwaliteit, inclusief plasma tv, spiegel, handdoeken, draadloos internet (gratis), rookvrije kamers, om tot rust te komen na een lange dag. Daarnaast garanderen de talrijke recreatieve mogelijkheden dat u zich tijdens uw verblijf kunt vermaken in het hotel. Fantastische faciliteiten en een uitstekende locatie maken het Starria Hostel de perfecte uitvalsbasis om van uw verblijf in Seoel te genieten. Hostel did great in managing a zero-waste and sustainable business. Waste segregation was strictly practiced, shampoo and body were provided in dispensers. Staff was able to communicate well in English, although had a few difficulties understanding at first. Everything is good. The kitchen will be a bit crowded since breakfast only provided until 9 a.m. Maybe breakfast shlould be provided until 10 a.m. Reception is great and helpful. 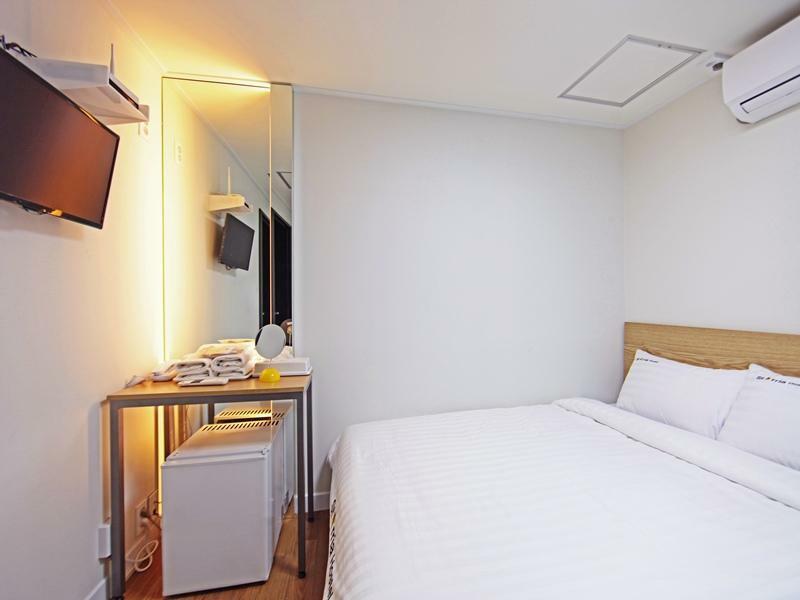 Just a 500m walking distance to the famous myeondong shopping street. Easy accessible to the subway station and bus stop. There are 3 convenience store near this hostel and a few cafes along the street. I really love my stay here and would come again next time. Thank you. I enjoyed my stay at Starria! Thanks to the friendly staffs! Their room is just enough for the 3 of us. The hotel is not as steep as the other side of the area as I used to stay at the right side street from the Pacific Hotel. You can still walk even you are tired haha!!! I will definitely be back! Walking distance to Myeongdong area and Subway thus my review title. Plenty of convenience stores along the way. Breakfast was decent with cook your own eggs with coffee, bread, cereals to start your day. We enjoyed our stay at Starria Hostel. The location is close to myeongdong shopping street. You need to get off myeondong station Exit 3 if you will be taking the airport bus then you will see the Northface building on your left and 7/11 store on your right. You just have to straight ahead and pass by pacific hotel all the way up. There are restos on your way as well so no need to worry if you’ re hungry after your trip or shopping. It’s easy to check-in and the room is very basic and just enough for 2 people. If you’re claustrophobic, this room may not be for you. The shower room is also class but frosted outside but still sine might be unconfortable on this. There’s aircon and heater so no need to worry if you come summer or winter. There’s ref, blower and you can request for new towels. We did not ask for cleaning everyday even if we stayed for 6 days because the room is so small and our things are scattered. They have breakfast which is just ok. You cook your own eggs, then toast, juice, coffe and free water refill. This is also near namsam tower. You just need to go straight and walk for 5 minutes to reach the namsan cable car going to the tower. I would recommend this hotel for convenience and value for money. We almost tried all the resto around the area and it’s all good at very reasonable price. On your way back to the airport you just need to cross he street and to myeongdong exit 8. Reception area is close from 1am - 6am. If you need them to book a taxi to airport before 6am, you have to inform them in advance but they will tell you to wait outside yourself. The hotel hallway was very dark and the reception area has a damp smell that i think was caused by the humidifier. There’s only 1 lift in the building. Simple house keeping was only done when told BEFORE 11am, if you inform after 11am they will reject your request. Therefore, you need to bring your own towels down to the Receptionists to exchange and throw the trash at B1. Breakfast is only 7am-9am. The extention plugs in the room are kinda lose, so u need to press down the plug and charge your device. The towels are small too. They didn’t allow us to on the aircon, so they say to open the windows since its winter but the floor heated provided you on the heater yourself. Position of the door and the toilet bowl its weird. Feels like every time when you open the door, you will knock the toilet bowl. For the price you pay, you can stay at a better hotel. There’s no cups and room slippers given. When we check in and check the beds and pillow, we found a strand of hair on the bed. There’s a blue cloth on the bed, which makes you feel very hot when you sleep even you open the window and sleep. The rooms need to be more sound proof. Due to the windows open during our sleep, there’s alot of noise and cats meowing outside the hotel and we did not have sufficient rest. So, Book at your own risk. Do note that we stay during WINTER. My second time staying with Starria and still they have provided what I needed. Everyone has been so helpful! 5-minute walk to subway station (Myeongdong Exit2) and to Myeongdong Shopping Street. Near convenience store and restaurants. Breakfast included - I am not complaining with the bfast but I suggest they add a little like salad or ramen. ☺️ Also, I just hope they can still offer free laundry for those staying for like more than 4 days. (I noticed that there’s already a charge for laundry service based on the reminders they give upon check-in). Overall, two thumbs up for Starria Hostel! See you again next year! 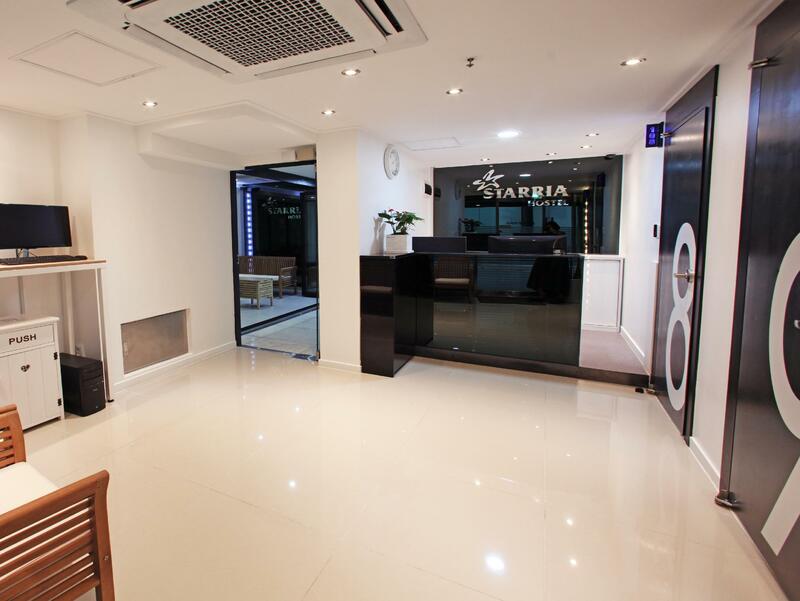 This hostel is located at a very strategic location which is at myeongdong. For muslim traveller, there is one halal restaurant that owns by Malaysian and you can eat there. Breakfast was simple and good. Room is clean even it is a bit small but we can open 2 big luggage at the same time. The service is also good. We gave our clothes to them to do laundry and they will do it for you. You just have to pay 3000won for the laundry. This hostel also can book a taxi for you if you want to go to the airport. Overall, I would really recommend this hostel to my friends. Not sure what the standard size of a room in Seoul however for me it looks a bit small. the room has a window but without any visual features. the hostel looks like well managed, the staff are very supportive and always willing to help and give advice. would consider coming back. Staff was really nice and helpful. Even when we came around 1:15 am (because we got lost), she still accepted us and had us checked in. Staff also offered to help me by calling my wifi operator using her own phone ( because I borrowed a portable wifi from the airport). Place is near Myeongdong station and is literally in front of Myeongdong district. 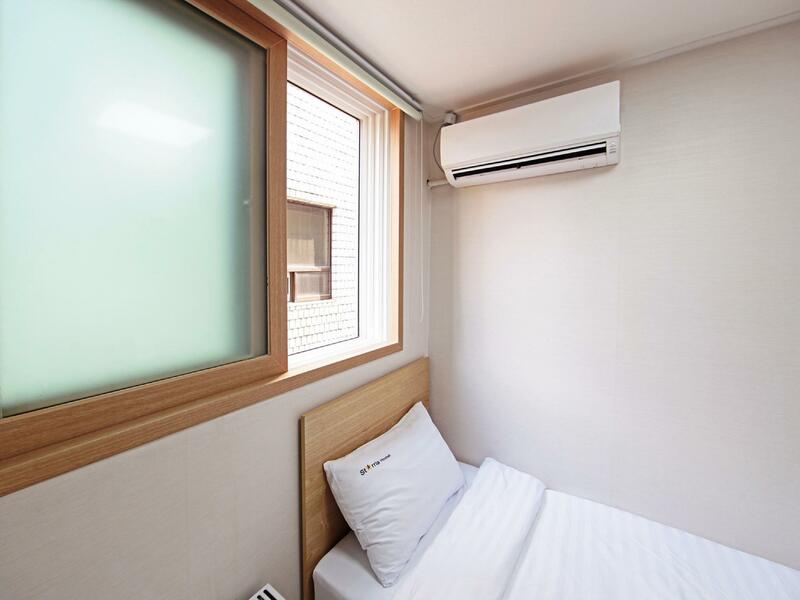 Location- 5 mins away from Myeongdong Station Exit 2 and 3; 10-15 mins walk to Cable Car going to Namsan Tower Breakfast- Includes cereals, bread, coffee, juice and eggs which you can cook based on your preference Room- a bit small (no cabinets) but cozy and has a private bathroom (with shampoo and body wash). There's a mini refrigerator, a television and a hairdryer. Staff- They are very approachable and can communicate well. Perks- Free Hanbok costume photo op. You can also print a photo at the reception area for free. All in all, the place is great for travellers. very near the Subway Myeongdong Station.. helpful staff. Overall, I enjoyed our stay in Starria. Though you need to walk a few metres from the Myeongdong station, it's location is very convenient, very near the Myeongdong Night Market. 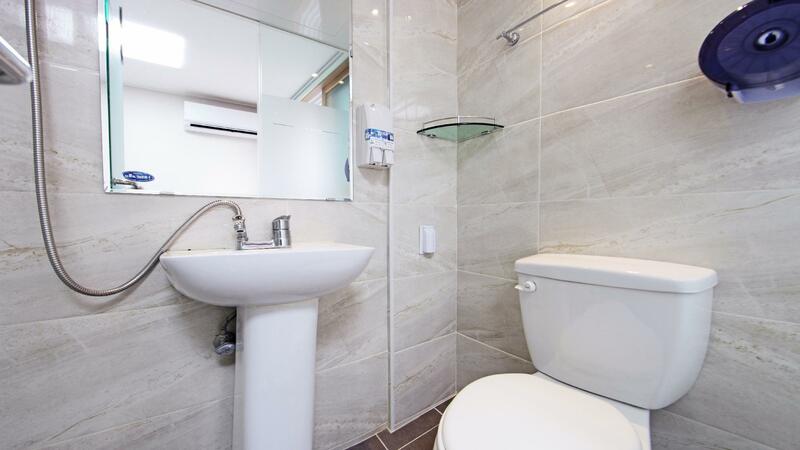 The rooms are quite small and so is the bathroom/toilet but the cleanliness makes up for the compact space. The floors are also heated and is a very good escape during cold nights. The breakfast is very limited but there are many small stores/restaurants in the area, where you can buy more food. I'll definitely consider Starria the next time I go back to Seoul. Value for money. It’s a simple hostel with a perfect location with minishop and restaurants outside. They staff were all friendly and warm too especially the girl in the night shift. She help me with ordering food and check in. 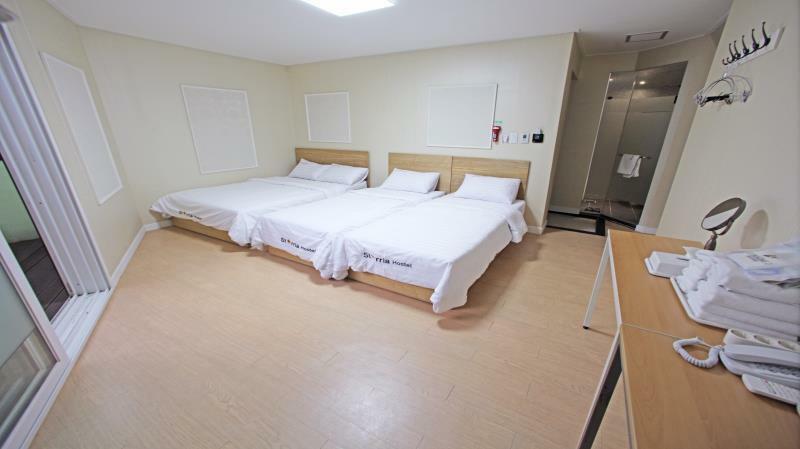 Room is same as the picture, location is few minutes walk from the station and across Myeongdong Shooping street. Self-service breakfast, consistent and good considering the price. Though no cleaning, floor is heated just like local house and so good during cold season. Will recommend and stay again when i return to seoul.